One of my favorite beverages to enjoy is an ice cold Pepsi. The problem is that I may very well be the slowest drinker you have ever met. If I am just sipping from my can of soda, it could take me up to 5 hours to finish it. Halfway through that 5 hours, my soda has become slightly flat and warm. To remedy the problem with my soda turning warm, I use an ice pack that fits around the can. To combat my problem of losing the carbonation in my soda, I use Bottle Tops to keep the can covered. 1) These tops appear to fit just fine on a standard can of soda. 2) Since these Bottle Tops are reusable, I think $10 plus S&H is a good price for twelve. 3) To put these toppers on, it is easiest to rinse off the top of the can and open your can first. 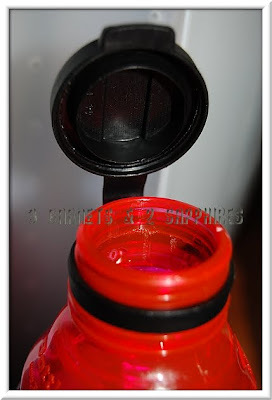 Then push the Bottle Top on with the cover shut. 4) It does take some strength to put these covers on the can, as well as removing them. I do not think a younger child will be able to do either unassisted. 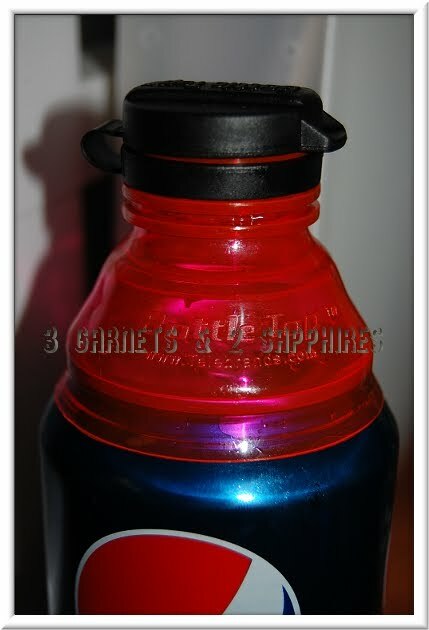 5) When you lift the drink to your lips, the flip top will touch your face. I found this to be bothersome, but it was not a problem if I remembered to hold the attached cap down with my finger when I took a drink. 6) These Bottle Tops are not dishwasher-safe. Because ours is such a busy household, I would rather pay more money and/or receive less toppers in exchange for ones that are top rack safe. 7) Since the soda washes over the top of the can when you take a sip of your drink, I was concerned about the seal around the perimeter not being tight, which would allow the liquid trapped around the seal to leak out and run down the sides of the can. Although there were no problems in general, there were two instances when soda did leak past that seal. Since I drink soda while I work at my desk during the evening, I usually leave the empty can on my desk until morning. Even though the topper did not leak while I was drinking my soda, it did leak after sitting on my desk overnight. We did have the topper leak one other time. That was when when my husband opened the topper with one hand while in the car. He must have squeezed the can and pushed the cap up in a way that broke the seal around the can. 8) Because these toppers come in different colors within the set, it makes it much easier to discern which soda belongs to whom in our house. Overall, I think these Bottle Toppers would be great to use for children to prevent spilling and for using outdoors to keep debris and insects out. I do think that you can use these toppers on cans of soda that you put back in the refrigerator to save for later, but I would not leave it for more than half a day or the soda trapped around the edge of the topper might start to leak out the seal. For a limited time, you can purchase 12 Bottle Tops and receive a free can tab lifter for $10 plus the cost of shipping and handling. You can read the details about this offer at BuyBottleTop.com . Thank you to Bottle Top for sending us a set of sample toppers free of charge to base this review upon and for providing a second set for our contest prize. One lucky reader will receive a set of 12 Bottle Tops (in assorted colors). Leave a comment telling me what your favorite canned beverage is. You MUST do this to be eligible to win this contest. 3) For 10 extra entries, blog about this contest linking back to this post AND BuyBottleTop.com . Then come back here and leave TEN separate comments with the link to your blog post.